Police officer Simon Schembri (right) receives support from BNF Bank. 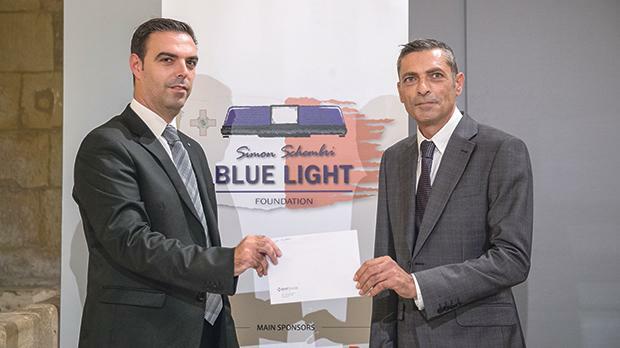 The Simon Schembri Blue Light Foundation was the latest non-profit organisation to benefit from funds donated by BNF Bank, via its corporate responsibility arm. The newly formed association honours first responders, civil protectors and their families and seeks to raise awareness about the hazards their work entails. The bank, in its commitment to improve the lives of others through community initiatives, was quick to support this organisation which promises to support the welfare of its members in times of serious accident. The main objective of the Foundation is to create a fund to benefit, where necessary and possible, those members of emergency services including paramedics, police, correctional facility officers, the armed forces and members of the civil protection who suffer physical injury while on duty. Other objectives include providing moral and psychological professional assistance to victims and their families. The organisation also seeks to increase exposure of the importance of the day to day duties carried out by employees in these sectors who give an invaluable service to society, and of the hazards they come into contact with, in their regular tour of duty. In Malta, the Police Corps, Civil Protection, Armed Forces and Corradino Correctional Facility together employ 4,500 members.